- Publisher For years genealogists, genetic counselors, and family therapists have used genograms-family tree diagrams-as a important tool in their work. Now Barbara Wendland and Larry Easterling show you how to use genograms in your congregation to promote spiritual growth, build community, and enhance communication. Based in both their own small group experiences and in years of workshop leadership, the authors demonstrate a broad understanding of how knowing and sharing our spiritual roots can contribute to a more dynamic congregational life. Employing a lively variety of personal stories, they provide clues and immediately useful tools to uncover your faith heritage, and gift churches with a powerful instrument for building more intimate communities. - Publisher For years genealogists, genetic counselors, & family therapists have used genograms--family tree diagrams--as a important tool in their work. 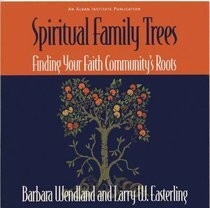 Now Barbara Wendland & Larry Easterling show you how to use genograms in your congregation to promote spiritual growth, build community, & enhance communication. Based in both their own small group experiences & in years of workshop leadership, the authors demonstrate a broad understanding of how knowing & sharing our spiritual roots can contribute to a more dynamic congregational life. Employing a lively variety of personal stories, they provide clues & immediately useful tools to uncover your faith heritage, & gift churches with a powerful instrument for building more intimate communities. For years genealogists, genetic counselors, and family therapists have used genograms-family tree diagrams-as a important tool in their work. Now Barbara Wendland and Larry Easterling show you how to use genograms in your congregation to promote spiritual growth, build community, and enhance communication. Based in both their own small group experiences and in years of workshop leadership, the authors demonstrate a broad understanding of how knowing and sharing our spiritual roots can contribute to a more dynamic congregational life. Employing a lively variety of personal stories, they provide clues and immediately useful tools to uncover your faith heritage, and gift churches with a powerful instrument for building more intimate communities. For years genealogists, genetic counselors, & family therapists have used genograms--family tree diagrams--as a important tool in their work. Now Barbara Wendland & Larry Easterling show you how to use genograms in your congregation to promote spiritual growth, build community, & enhance communication. Based in both their own small group experiences & in years of workshop leadership, the authors demonstrate a broad understanding of how knowing & sharing our spiritual roots can contribute to a more dynamic congregational life. Employing a lively variety of personal stories, they provide clues & immediately useful tools to uncover your faith heritage, & gift churches with a powerful instrument for building more intimate communities. Barbara Wendland is a writer, publisher, and teacher in Temple, Texas, with over 40 years of lay leadership experience in the United Methodist Church. Her monthly newsletter on personal and corporate spiritual renewal, "Connections", is circulated to thousands of readers in 12 denominations throughout the United States. Larry W. Easterling is Vice President of Mission and Spiritual Care at Advocate Christ Medical Center in Oak Lawn, Illinois. He is an ordained United Methodist pastor with over 20 years experience in ministry and leadership in both congregational and clinical settings.